Home / Now is your chance! We are so lucky. Marjorie Garcia Barnes is coming to teach for us. This is a rare and special opportunity. She and her husband are moving to China very soon so please consider joining us for one or more of these classes. A good time is sure to be had! Venezuelan-born and award-winning jewelry designer and instructor Majorie has been working with a wide variety of beading and metalsmithing techniques over the last 30 years, gaining a reputation as an artist with a unique and particularly bold sensibility. She is also certified as a PMC (or Precious Metal Clay) Artisan by Rio Grande, and has been working as a jewelry and math teacher for the past 27 years. 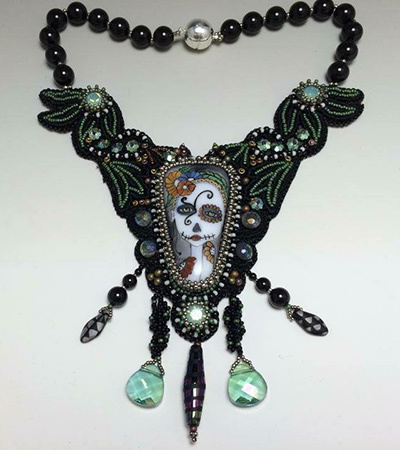 Join us to create this fabulous necklace featuring a Painted Lady cabochon by A Touch of Glass. I love this necklace! The detail in the cabochon is beautiful; when combined with bead embroidery and a few beaded dangly bits it rises to a new level of magic. Join us to make either a bracelet or necklace and learn a whole host of new techniques! Love that. We will make bezels and embellish them with crystal clay, rhinestones, beads, etc. And then add bead embroidery to create a wonderful piece of jewelry. I’m sure classes will fill fast, so sign up soon. Full details are on our website. « Previous: More Stitchy Fun and new guides!